Camden Lakeside’s Division 3 team are celebrating after winning the 2019 Metropolitan Pennant competition final against Manly. Three extra holes were needed in a dramatic final to determine the winner at Terrey Hills Country Club. Team captain Matthew Brinkworth was also elated with the result. “It was a nerve wracking finish, it could have gone either way,’’ he said. “Jay Chroma really held it together and played a solid game when it counted,” Brinkworth said. Winners: the Camden Lakeside Division 3 Pennant team, Scott Shanahan, Corey Dowling, Jay Choma, Matthew Brinkworth (captain), Hugh Leicester (manager), Robbie Minns, Darren Hawkins, Peter Coles (co- manager). Back: Ben Warby, William Wright. 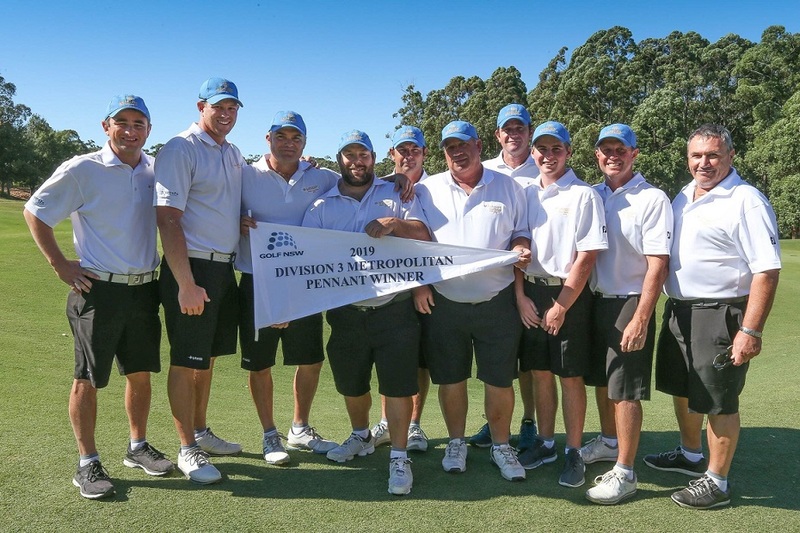 The Lakeside team were confident going into the final against Manly Golf Club. After the first four holes the match was all square and it was clear the final would be a tight affair. Matt Brinkworth proved too strong for his opponent with a 5 and 4 win. Darren Hawkins at number three drew the short straw, running into the current Manly Club champion who was also undefeated through the tournament. Darren fought hard all the way but was eventually beaten 3 and 1. It took three extra holes to finally decide the Division 3 winner and Jay Choma was in the thick of it for Lakeside. Both players would par the first hole and repeat the effort in the second extra hole. In the third extra hole, Jay’s opponent was in trouble off the tee. Jay was on the green in regulation while it took his opponent three shots to get on the putting surface. Jay’s birdie putt sat on the edge of the hole and par was conceded. The Manly player attempted his 15-foot par putt to extend the match to a fourth extra hole, but this time was unable to do so and Lakeside were celebrating a great victory.